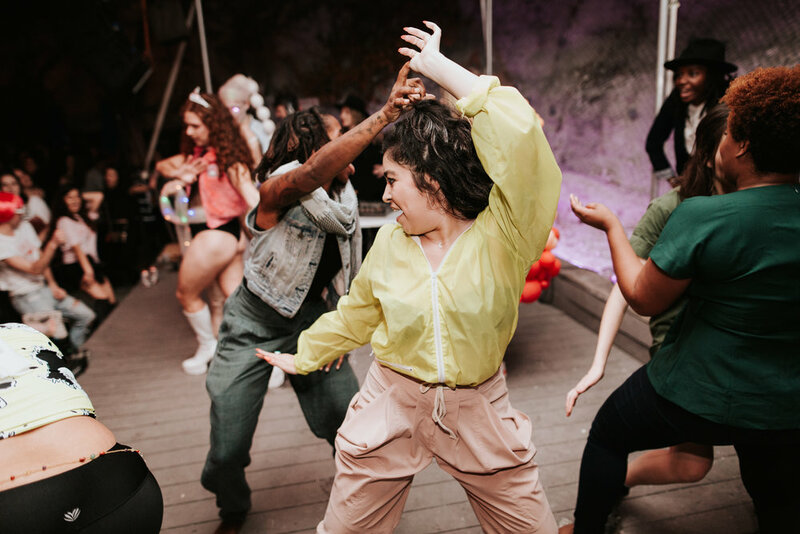 STATE OF THE UTERUS* (*uterus not required) is our annual party for progress; together, we raise money for nonprofits invested in reproductive justice, menstrual health and community health, while dancing our butts off and learning about local politics. For our 2nd-Annual State of the Uterus, we fundraised for Homeless Period Project ATX (now known as Flo Code), Survive2Thrive Foundation, Planned Parenthood of Greater Texas, Counter Balance: ATX and ourselves (BossBabes ATX)! We raised $8600 (surpassing our fundraising goal *sounds foghorn*) for these five organizations, while partying our asses off. here's a peek at everything that happened. WHY DID WE THROW THIS PARTY? We believe coalition-building creates strong communities. 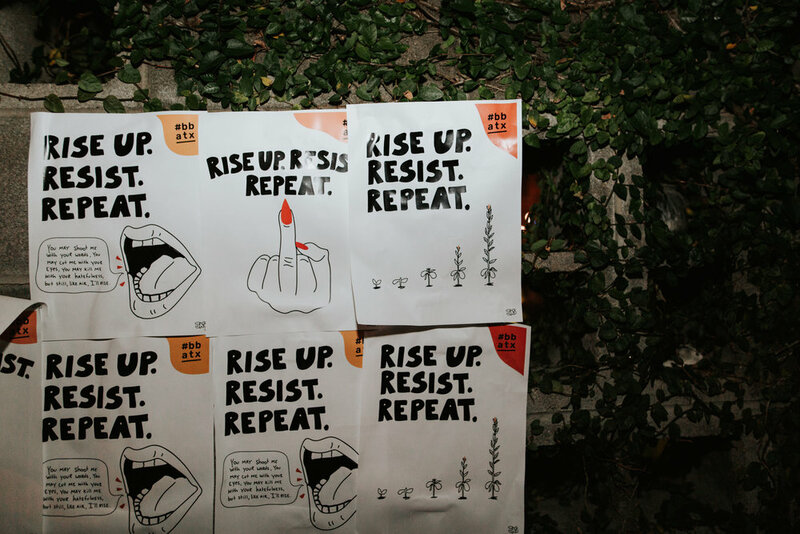 We provide information on issues that effect women’s civil rights, sexism, racism, gender inequity and other issues addressed within intersectional feminism, in the hopes that all may form their own opinions and actively engage with causes that matter to their communities. At State of the Uterus*, we stand to dismantle the stigma that prevents all genders and sexes from receiving appropriate reproductive care and health services. We stand to acknowledge and fight against the intersectional issues that affect the health of women-identifying people, like access to resources that cover basic needs, systemic racism, transphobia, abuse and violence, sexual miseducation and more. We stand to create spaces that prioritize individual agency and the communication of truthful, responsible information. We stand to decriminalize abortion. We stand for ourselves. Download custom flyers created by Jasmine Brooks for #SOTU2018. We've got people to thank. We've got a lot of thank-yous in order. First, big shouts to Cheer Up Charlie's for hosting us. Please continue to support this space and spend your money at this queer-owned, woman-owned venue! Second, huge ups to all of our staff and volunteers. We had 16 #bossbabesATX team members and volunteers working on this event! We appreciate their donated time and could not have pulled off the event without them. Fourth, major ups to Diana Ascarrunz Photography for the incredible event photos. Check 'em out! We've also got some awesome photos from the DTFeminist photo booth with OKCupid, thanks to Simplebooth. MEET THE PRODUCERS, PARTNERS AND VENUE. This production has been made possible in part by the LINE ATX and Resplendent Hospitality. About Cheer Up Charlies, the venue: CUC is an ambiguous space-for-everybody bar. They're known for LGBTQIA & friends hangout/music/art/dance parties.